I've just come back from UCSC's roof top, where RMS came to say hi to the many geeks, students and staff as the last event before he heads back tomorrow noon. The last couple days had been quite hectic, balancing between home, work and organizing RMS events. From before his arrival on the 14th to the present day, its been a juggling act of trying to stay on top of things. It was challenging and non trivial considering the nature and importance of the visitor (after all RMS started it all) and the fact we wanted to get so many different groups involved. There was ICTA, FOSS.lk (which in itself is a bunch of groups), SLIIT, UCSC, UoM, UoP, IIT, NIMB, APIT, PC House, Cannonical, Redhat, WSO2 and probably more. And looks like we pulled this one off quit well, phew! RMS arrived in Sri Lanka on the 14th of Jan and I ended up tagging along with Himira of ICTA/LKLUG to the airport. The flight was supposed to be at 11:45am and we were doing the whole CIP (Commercially Important People as opposed to VIP) thing. But it so happens the new CIP doesn't have a lounge and so we ended up staying at the VIP lounge. Besides getting up close but not personal with CBK, JRaj and SarathA as well as me reading RMS's book, we were pretty much waiting, waiting and waiting, for 4 hours! RMS was on a Sri Lankan UL flight from India, which was only supposed to be an hour flight. When asked as to the reason of the delay from one of the airport staff, he humorously explained it was due to UL flights being Usually Late. There was nothing we could do anyways since we were pretty much in house arrest with no way of even going out for a bite. Anyway I didn't see him again till today at the Malabe SLIIT event where he delivered a speech which can only be described as one of the best speeches I've heard of his filled with humor, ridicule, inspiration and wisdom. Somehow he managed to create a perfect fusion of speeches he is known to give into one spectacular speech. The auditorium, known to support about 800 people was full with a few people even standing at the back. And yet the place was silent, if not for RMS's voice. Ven. Mettavihari and Chamath managed to clear the Ubuntu CDs that Cannonical had couriered from customs and bring it to SLIIT just in time, before the event ended. Those CDs vanished fast - 600 CDs gone in 600 seconds! Now if you knew and admired RMS and still missed the events, may be because you didn't know or just couldn't make it, well you have my apologies (for not doing enough advocacy) and sympathies (might have been a once in a life time chance if he never comes back, though you never know). If you don't know him, well then you probably think your not missing much, but boy were you wrong! In any case we do hope to encode and upload video of his speech on to one or more of the popular video uploading servers. So come back to this post and you might just find a link to it. Chanux can you pls tell her to change the title. OMG if RMS sees that he is an Open Source Guru, he'll freak out! Well I'll ask her whether it is possible. It is government stuff no. May be it's irreversible :( . Hey. This RMS guy is brilliant! But I don't agree with the free software stuff. How feasible is it for organisations to have complete control of the software they are using. They may have to engage in R&D and development work for life. It may be more practical to use an established commercially available software to run the business like SAP, Finacle, JD Edwards etc. Why reinvent the wheel after all. 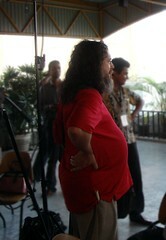 Yup RMS is brilliant and his speech was inspiring. Hopefully we'll get it soon to upload. Freedom a company gets from Free software doesn't necessarily have to be exercised directly. They can hire a third party to make the necessary changes. There might be other companies that pick this Free Software up and form a business around providing customization/support. In contrast, if you need to customize a proprietary software (which you mistakenly mention as commercially available), you have to beg from its developer (they may choose to ignore you even if you want to pay). So it turns out that in most cases Free Software can be "more practical"